The music of the harp enhances any worship service. 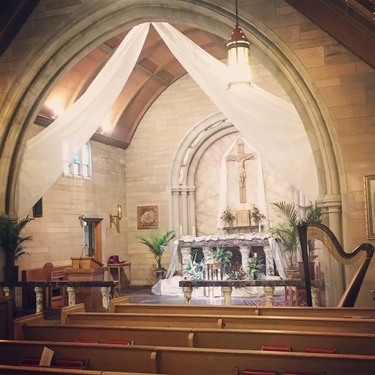 I can play sacred and classical harp music for prelude, interludes, communion/eucharist, offertory, special music, and postlude. Improvised music for meditation can also be provided. Dates in December and during Lent and Easter book quickly, so contact me well in advance for the best availability! I have an extensive repertoire of sacred music for all seasons of the church year. I can work with your church musicians and staff to create a meaningful program tailored to your congregation's needs and musical tastes.